I think I’m going to make it. Only sixty-two bajillion papers left to grade, and my first semester back in the classroom will be in the books. My last class was Thursday, and I have to tell you–my subconscious must have taken that as license to KNIT!!! I’ve been shamelessly ignoring my responsibilities and knitting away on all sorts of odds and ends all weekend. The picture above is the tiny front of a cardigan for a new bundle of preciousness I’ll get to see for the first time over the holidays. The cute is killing me. Pictures soon. There’s also my Inlet cardigan. Little problem with that one. I finally finished up all the pieces, gave it a good soak, and set to work pinning it out on my blocking board. While I was futzing around trying to get the fronts to line up, I realized that something wasn’t right. Ugh. At some point during the craziness of the semester, I must have gone to finish up that front left side and temporarily lost my mind. 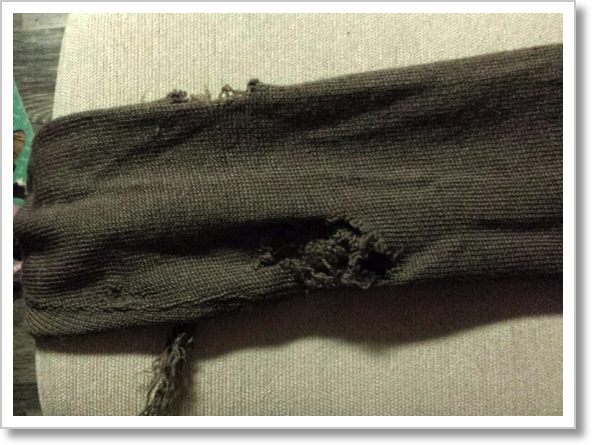 Why in the world did I decrease at the top on the armhole side?? I’m trying to focus on the fact that this is knit bottom up, so fixing it shouldn’t take long. Still . . . The other thing that’s been on my mind is the Fringe and Friends New-Year Knitalong. It’s a Logalong! I’ve wanted to try log cabin-ing forever, and I absolutely love a good knit along. I’m pretty sure I’m going to be on board for this. Karen Templer recommended Ann Shayne and Kay Gardiner’s Log Cabin Field Guide as a good starting point. It explains the basics of how the log cabin construction works and gives you a few variations to try. I enjoyed knitting this little dish cloth for practice. Kay Gardiner is hosting a discussion board where all sorts of fun ideas are floating around. Plus, Karen Templer has been regularly featuring ideas for log cabin projects on the Fringe Association blog. It’s the images at the top of this post that have really captured my imagination. I’m thinking of doing a throw like this in a log cabin version with some combination of speckledy yarns. Maybe. There are so many delicious possibilities. Anyone else thinking of joining in? That pile of papers isn’t going to grade itself, so I should get going. I’ll just close with a few pictures of the amazing weather we’ve been having. On Thursday Paul and I took Django for a walk, and the world looked like this. By yesterday, we had this! I love, love, love the first snow of the year, and this one has been spectacular. Here’s hoping the weather is nice where you are and, most importantly, that there is lots of knitting in the forecast! Be well, my friends. Today is day one of my two-day fall break. Despite the mountain of papers waiting to be graded, I was determined to get some knitting in. Not the knit a few rows before bed kind of knitting but some actual soul soothing knitting. As an extra treat for myself, I thought I’d spend the time not just knitting but finishing. I’ve had my Looped Loop sitting in a basket waiting to be bound off for at least six months. Binding off required Reverse Kitchener Stitch, though, and there just hasn’t been space in my brain for that. The cool weather we’re having this week seemed like a great reason to take the leap. I must say I was also hoping to have a wonderful story of Reverse Kitchener glory to report. Here is a shot of the kitchenered ends. They’re right in the middle there, a tiny bit to the left of the middle vertical chair rail. From this distance it looks okay, but honestly, I’m disappointed. I was hoping the join would be truly seamless, and it isn’t. The knit and purl columns don’t line up exactly. Plus, the seam area has virtually no give. Reverse Kitchener is now on my list of things to master, and I’m planning to try Tricksy Knitter’s method next. I’ll report back. If anyone has suggestions, please let me know. Augie did a close inspection and decided he wasn’t thrilled with the results either. Despite the Kitchener issues, having a cozy new cowl to wear when I go back to school on Wednesday makes me happy. And the yarn is divine. It’s Dream in Color Smooshy with Cashmere in Rasberry Blaze. Absolute heaven. The fall weather has also ignited the need to bake. Yesterday’s goodness was Smitten Kitchen’s Jacked Up Banana Bread. It’s the best banana bread evahhhh. We had it for dinner, breakfast, and lunch. Things continue to be hectic, but I am mostly keeping up with everyone’s posts. I’m sadly behind with commenting but am loving reading about what everyone is up to. Until next time, be well, my friends. And knit on! Behold the Crystal Palace Yarn sweater! Its proper name is He’ll Wear It Every Day (from The Yarn Girls’ Guide to Simple Knits). As you can guess from the pattern name, it’s actually sized for men. I knew it would be a bit big, but I just knit the smallest version and went down a needle size. It’s definitely roomy, but I think it’ll be fine for knocking around. 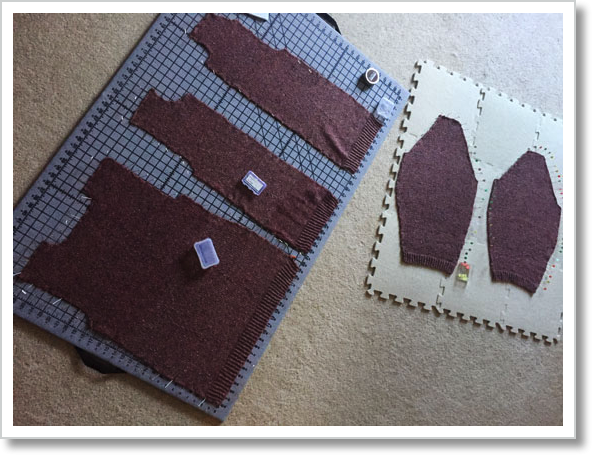 I found the pattern when I was looking for a quick sweater knit in pieces to remind myself what it was like to knit set-in sleeves. I’m planning a sweater for Paul and was thinking this construction might suit him better than a seamless sweater would. It had been so long since I’d done it, though, that I wanted to find out if it was really as big of a pain in rear as I remembered. Since the last time I knit a sweater this way, I’ve discovered Amy Herzog, and I think I must have been channeling her when I did the sleeve caps. I’m not saying it wasn’t a little tedious, but the shoulder seam makes for such a nice fit that I think it’s worth it. I don’t find nearly as many patterns for sweaters with set-in sleeves as I used to, though, so I’m going to have to do a little looking to choose something for Paul. Meanwhile I’ve got the never-ending, giant blue rectangle to keep me busy. Surely . . . SURELY, I will finish it today. If I don’t, my next blog post will probably be from the psych ward. At least when I was working on the infamous blue rectangle this weekend, I had the company of lots of other knitters to keep my spirits up. Our local fiber contingent got together for World Wide Knit in Public day and spent the afternoon knitting outdoors in beautiful Jonesborough. This picture is of my BFF Cari and me. I say this every year, I think, but we actually MET on WWKIP day four years ago! How’s that for a knitting fairy tale?! Howdy, knitters! Sorry for the radio silence around here. I’ve been knitting, working, yoga-ing, reading, knitting . . . you know, the usual. Extreme Double-Knitting is a term coined by Alasdair Post-Quinn, and as far as I know, he was the first one to publish anything about how to do it. His book Extreme Double-Knitting: New Adventures in Reversible Colorwork explains the basic principles and shows how a non-reversible double knitting chart might look. He doesn’t go into the technical details about how to actually produce such a chart, however, and I had no idea how to accomplish such a feat. I can’t tell you how happy those properly oriented question marks make me. It’s the small things, I guess. This week’s square is from a game I’ve never heard of called Katamari Damacy. I have no clue what it’s about, but I like the square. I started it during the Super Bowl. The weather here is: snow. What’s going on in your knitterly world? I might be in love with the Travel Shawl. Folded in half it’s a cozy shoulder wrap. Opened up, it’s a bigger wrap. Or even a small blanket. And it’s a fairly quick knit. I knit all but a tiny bit of the beginning and the outer edge during a few weeks in November. This turned out to be a bigger deal than I expected in the discovery department. I’ve knit enough lace to feel like I’m not a total novice, but I hadn’t ever seen a set-up like this. The pattern directions tell you to cast on, give you instructions for an increase round, and then refer you to the first chart: “Begin pattern from Chart A; work Rnds 1-28 once . . .” etc. What you’re just supposed to know is that you have to knit the chart four times to accomplish one round. You’re also supposed to know what to do as your stitch count increases. I did not know. Thank goodness for Tin Can Knits. A bit of searching brought me to their super helpful explanation of how to read lace charts. It all makes perfect sense once you get the basic idea. You knit the first section of edge stitches for each quadrant and then knit the center, stitch-repeat section as many times as you can while still having enough stitches left to knit the edge stitches at the end. In their words: “. . . you would work the edge stitches one time, then work the ‘repeat’ stitches as many times as possible (always reading the set of instructions from right to left on right side rows), before ending with the edge stitches at the end of row.” Once I understood the logic, I was off and running. As I do more lace shawl knitting, I think it’ll be interesting to see how many designers assume their audience knows these things about how lace charts work. In the heat of the moment, I felt a little grumpy about having to search for the information I needed to make sense of the pattern. Now that I have a little distance, I view it more as an interesting question than anything. What basic knowledge and skills should knitters be expected to bring to the average project? It’s absurd to think that every pattern would start from square one, but if a pattern doesn’t start there, then where?